As has become usual for Hirscher after a major championship, he suggested retirement could be close — even as soon as the end of this season. If this was the last performance on the big stage, he sure put on a show. "Ten more (World Cup) races are waiting for me," he said, when asked if this could be his last season in Alpine skiing. "We will see. Take a break and things will be way clearer than right now." Hirscher, who is 30 next month, referred to the pressure and expectations he was under at these worlds. As the most popular athlete in ski-crazed Austria, he lives under permanent and intense scrutiny. "The biggest emotion," said the seven-time overall World Cup champion, "is that the pressure has gone away from my shoulders. I'm feeling more light than before these world championships." Throw in the fact he has been feeling under the weather for much of this week, and it's remarkable how he managed to pull off an opening run that even he was impressed by. Hirscher destroyed the field with an almost flawless leg that gave him a lead of 0.56 seconds from Alexis Pinturault of France. No other skier was within a second of the lead and Hirscher told Austria's domestic broadcaster, ORF, that it was one of his best ever runs. After crossing the line, he swept around the finish area and wagged his finger in front of the TV camera. After coming second in the giant slalom behind Henrik Kristoffersen on Friday, the message from Hirscher was clear: The ski king was back. It meant Hirscher could be more circumspect in the second run — especially after a slip from Pinturault toward the end of his run that knocked the Frenchman into third place at the time. Hirscher needed to get down safely and he did just that, posting only the 25th fastest time for the second leg. "I knew that Alexis was not in the lead, so the first part I tried to push it really, really hard and then there were two or three gates where it was bumpy," Hirscher said. "Hopefully stay safe there and into the finish line. Not attack." 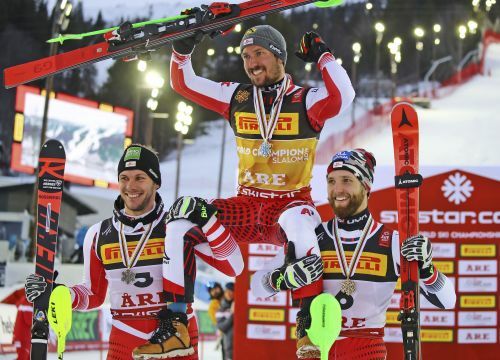 With his third world slalom title secure — matching the haul of the great Ingemar Stenmark — Hirscher saluted the fans in the grandstand and skied right into the arms of two other Austrians who completed the podium in a sweep that rescued the country's world championships. Michael Matt, whose brother is former Olympic and world slalom champion Mario Matt, was 0.65 seconds behind Hirscher, and Marco Schwarz was a further 0.11 adrift. "They've started right now to be really at the spot," Hirscher said, looking at his teammates in the post-race news conference, "and they will make us a lot of fun for the next years, I am sure." Hirscher hasn't stopped providing enjoyment for Austrian skiing for years. He is on 68 World Cup wins — 18 off the record of Stenmark — and next month could win his eighth straight overall World Cup title. The seven world golds — as part of a collection of nine world medals — ties the men's record with compatriot Toni Sailer from the late 1950s. Then there are the three Olympic medals, two of which were gold from last year in Pyeongchang. It seems increasingly unlikely he will be in Beijing for the 2022 Games, meaning he will finish his career without an Olympic gold in the slalom. His first run here will stick long in the memory, and virtually ensured the Austrian team would not be returning home from the worlds without a gold medal for the first time since Crans Montana, Switzerland, in 1987. "Now I am more tired than usual," Hirscher said. "That is why you see less emotion and less power in my whole interviews and photos. I am just done. "But, please believe me, I am super, super happy with these two medals. It means a lot to me. Every year I am getting older, everybody is expecting that it is working even better." With retirement clearly impending, skiing fans should enjoy Hirscher while they can.